Containment Protocols: RPC-994 is to be kept in a 3x5x3 concrete structure with a water and food tray, and is to be monitored frequently by at least two security cameras. All meat shed by the entity is to be incinerated. Anyone having eaten the meat is to be euthanized. RPC-994 upon shedding several clumps of meat. Description: RPC-994 is an entity that physically resembles a Gallus gallus domesticus, otherwise known as a common chicken. 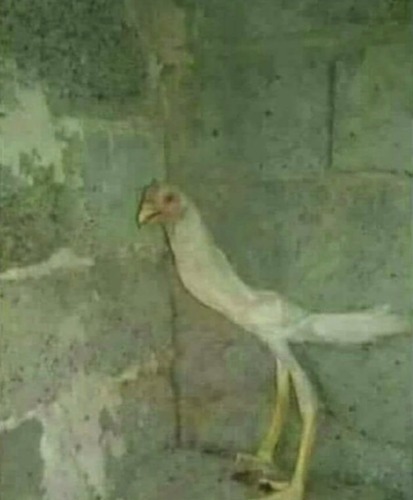 The entity displays behaviors consistent with a malnourished chicken, as it is frequently observed scouting for food and water. The entity seems to seek out human attention whenever possible, and will attempt to coerce them to give the entity food. Upon gaining an amount of muscle and fat typical of a chicken, RPC-994 will "shed" off meat, fat, feathers, and traces of its bones into clumps of edible material resembling fast-food chicken meat. Unlike other foods, RPC-994 will not attempt to consume the meat.